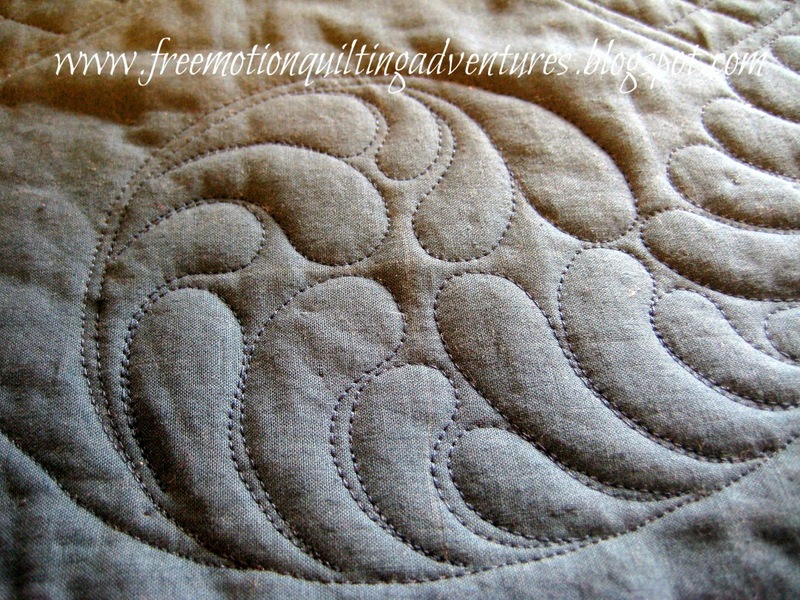 When it comes to free motion quilting, there's nothing I like better than to quilt feathers! I like to them where they are all wild and different though. So a huge border full of uniform feathers is a wee bit intimidating. When I first started marking the border, I was using the Fine Line 10" Continuous Curve ruler for the spine; flipping it alternately down a straight line for an undulating curve that was supposed to go all the way around the border. But I just couldn't work out the corners and get it spaced so it went well with the curved crosshatched triangle shapes. So I ended up using a circular spine so there was a curled up feather between every CCX'd triangle. It still didn't work out perfectly around the corners, two curl in and two curl out. But at a diagonal from each other it looks fine. And once all the feathers get added, it'll be fabulous! That's what I get for being all free-spirited and not drawing out all the elements of my design ahead of time, but that's just a part of how I am. I did go ahead and stitch the spines and the drop at the end of each curving spine, as I wanted to use that big teardrop shape to help me get every space filled with plumes. Then it was time to go back around and add the plumes. I had some trouble at first getting the inner plumes to turn in that circle evenly, but I wasn't trying to make them all identical anyway. I might redo a few spots on the first ones when I get done. It got better as I went along. 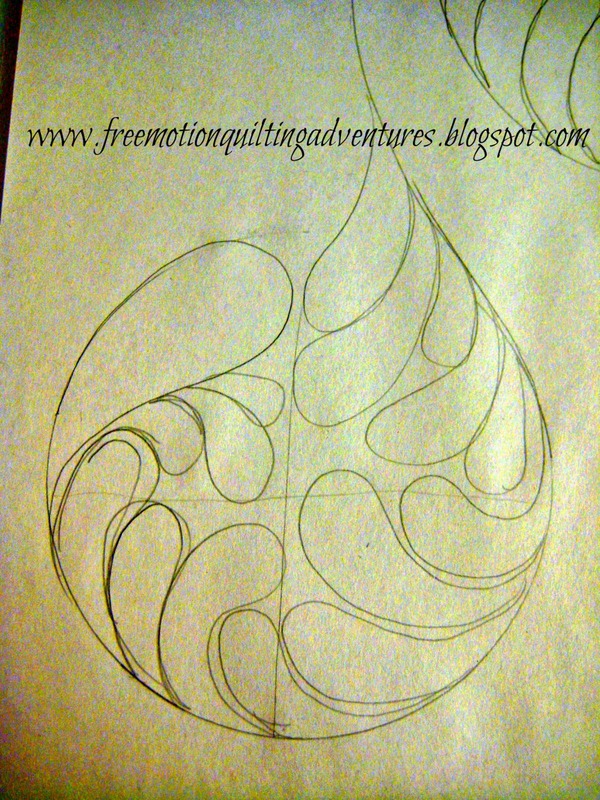 To turn that inner turning circular part of the feather, I divided the circle into fourths and then quilted each quadrant with a set of plumes that filled each wedge. The plumes have to vary in size in order to turn them this way. You can get another quilter's take on turning feathers at IvorySpring. I think these aren't bad, but I could still use more practice. It always looks worst when you're right at the machine, once I step back and take a look, it's so much better. Some of the plumes are longer and skinnier than I want, maybe I should have used a slightly bigger circle template. I made my own with my AccuQuilt circle die cutter and some dense cardboard. Best way ever to get perfect circle shapes! I used the big teardrop shape at the end to help 'tighten' the circular curve so it looks more like a spiral than a circle without having to use a different template. I also used the teardrop as part of the spine for the outer plumes, so I could fill all the space. We'll see more of these feathers in a few months when we do feathers as our Free Motion Mondays design, most likely in July. Do you love feathers? I hear that the more modern quilters find them too traditional, and I agree that some forms of them are a bit stiff and old-fashioned. But some quilts scream for feathers and there are so many variations that there's got to be something for every style. Amy!!!! They look fantastic....I know we are our own worse enemies when it comes to criticizing our work. And there is nothing wrong with bettering whatever it may be....but these are beautiful, really!!! I have a pretty harsh inner critic, but I trying to evict her! Thanks for the encouragement. Amy, your feathers are beautiful! They're my fav, too and I love the way you worked them out to fill all the angles. I can't wait to get to the feathers on my current quilt project for my granddaughter! Thanks for the informative post! Amy, I hadn't picked up my mail in about a week & a half until today. 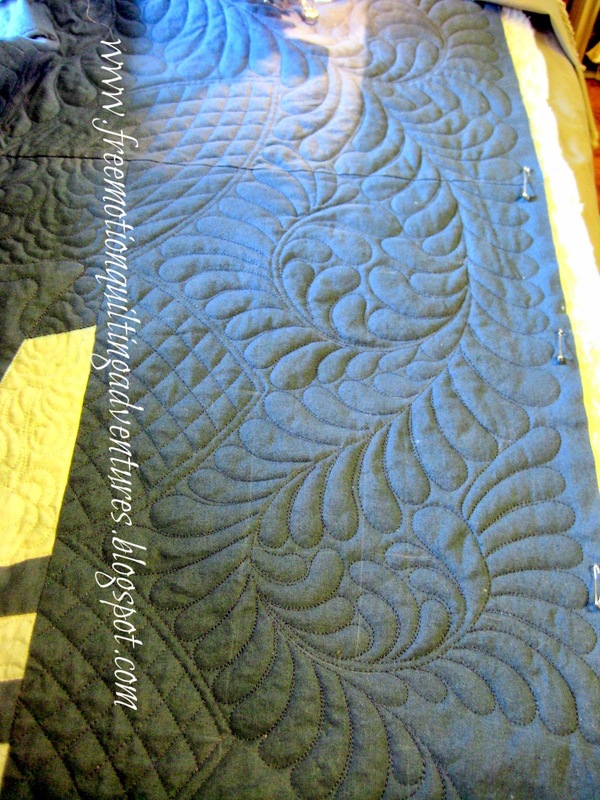 The Glide you sent me that I won from the McTavish QAL is beautiful! I forgot it was coming! (like someone gives me something every day!) I can't wait to play with it. Thank you so much. Patti, you are quite welcome! And speaking of not getting mail, for some unknown reason, I didn't get these latest two comments from you in my email. Just happened to see them on the blog. Hope I'm not missing a bunch of notifications from folks! Could have been me. I pulled up one of the emails you sent to me & it said it was a no reply so I put it here. Your quilt is gorgeous!!! I love feathers and hope to get half as good as you someday. Practice, practice, practice and you'll get every bit as good! Thank you Amy! I find your hints so very helpful. Thanks! It's fun to share my adventures! Looks great!, some folks have trouble heading off in a different direction with their feathers. Wendy @ IvorySpring, has some good hints as you have. The more you do the more your 'hands' remember. I love feathers & love the opportunity to put them on my customers quilts. You can keep them traditional, you can add modern twists, you can make them funky & you can personalise them too! Yep, they’re a lot of fun and versatile once you’ve got the hang of it! Although there may be some underlying "principles" to stitching the flowing/curving style of feathers (I've looked at Wendy's approach), the 'key' is to keep at them....practicing them in many different situations until you "make them your own". I do agree that they're somewhat of a struggle at first but, at some point, they will "click" and it seems you can do them everywhere. Jamie Wallen provides the 'hint' that each plume must come back to the spine at the appropriate angle to maintain a graceful appearance for the whole. I have found his videos to be most helpful. Having said all that......I love the graceful feathers you've done coupled with the curved cross-hatching!!!!! !Gorgeous border!!!!!!!! Good Morning Amy. I like your adaption for corners. As always, thanks for taking the time to share. I think you have some of the best and practical information on the web. Althea, you wonderful dear! You should have seen my smile this morning when I read your comment! Thank you! Keep on keeping on Amy! I'm so glad to have found you. I would love to be your neighbor so I could "peak in". Since neighbors, we are not, the internet is a blessing. Love your feather border. I know that many modern quilters don't use feathers for a variety of reasons but for me there's nothing that fills a space and elegantly as a feather. They are so versatile and you can make them any size and you can fill virtually any shape. Once you master the motion and design they stitch up so quickly! I'm looking forward to your Free Motion Design Monday in July! Love your feathers! I hope my look that great one day! Can you give me any advice on where to go to help me with feathers! I think the best thing is to keep doodling them. I'll work on putting a few internet resources together to share. Staring at our work too close and too long always seems to make us notice our mistakes. It's always better to take a step back and look at it from a distance. Your feathers are beautifully done. 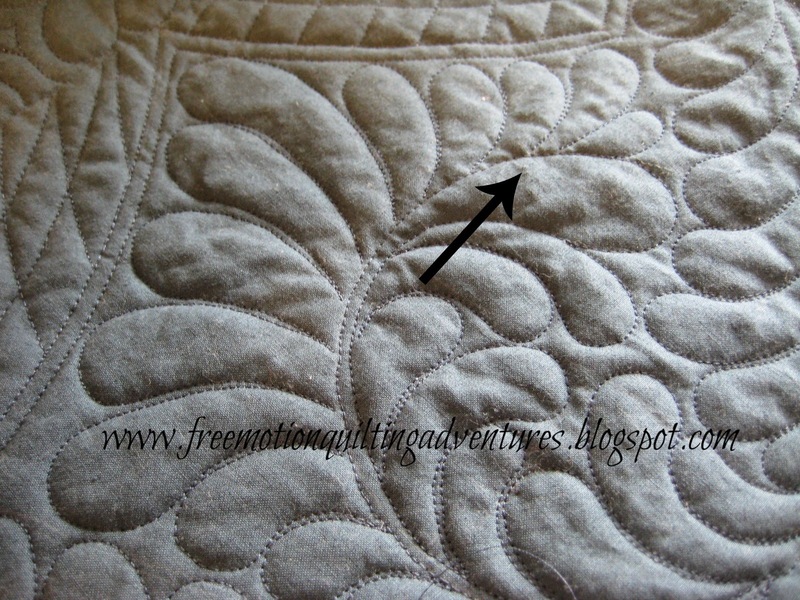 I would be proud to achieve feathers, like that, on one of my quilts. Hi Amy, Feathers are lovely addition to the quilt. I love doing feathers whenever I can, wherever I can. I often draw feathers in my head instead of counting sheep. 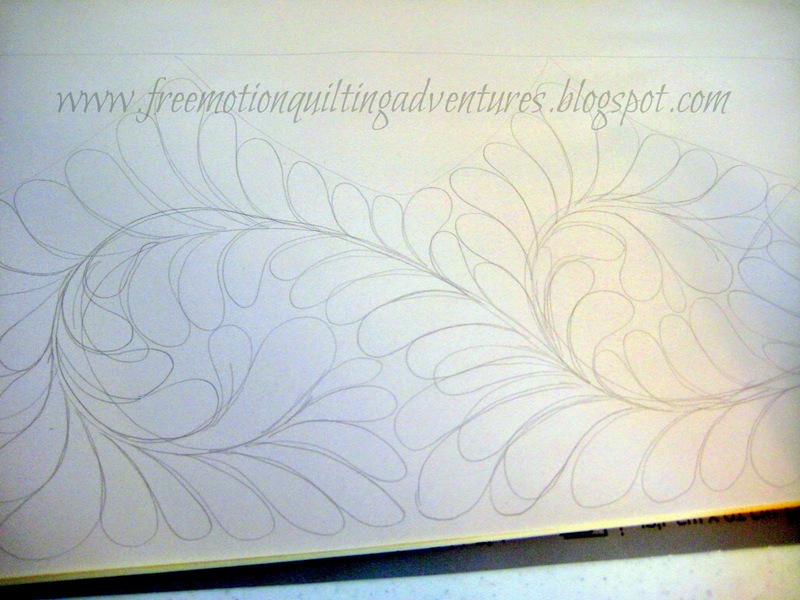 I'm feathering a border now to ease back into quilting after getting a new knee a couple of weeks ago. T think I'll add some cross hatching as well. Good I so need more practice at them. I wish I could have been part of the scroll flowers one. I want to learn that design. Thanks for doing a free motion monday. I can't wait to start to join in!!!! By the way, I forgot to mention but your feathers are beautiful! !